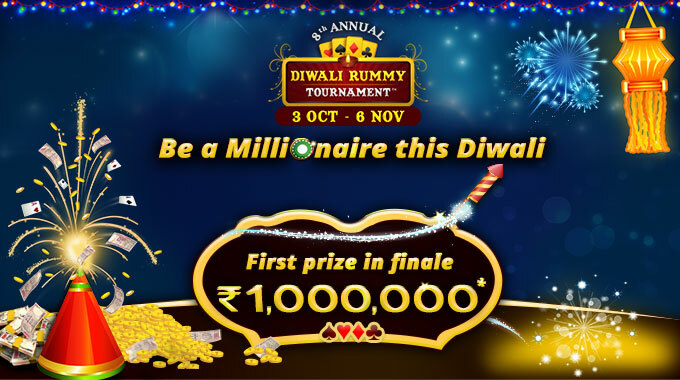 RummyCircle have huge plans for upcoming Diwali festival with cash prizes worth Rs.10 lakhs to be won. The celebrations at RummyCircle will last almost for a month with multi-level rummy tournament. All the players winning the daily qualifiers can move up to weekly finale for a clash for Diwali Rummy Tournament Finale tickets. The players will be winning cash prizes along with their ticket to next level of the rummy tournament. The tournaments will run from 3rd October to 6th November 2016. So, login now and register for free to get seated for this highly regarding Diwali special rummy tournament. The Diwali Rummy Tournament from RummyCircle will run from 3rd October to 6th October. The entry is free for qualifier rounds and the top players will take home some cash prizes along with their tickets to Weekly Finale. The qualifier rounds will run all day from 3rd October to 9th October. The winners will move to Weekly Finale scheduled for 9th October 3:00 PM. The Weekly Finale winners will win from a prize pool of Rs.5,00,000 along with their entry ticket to Diwali Rummy Tournament. The entry to this tournament is entirely free. So, join the qualifier rounds and win your tickets to a big fortune this Diwali. To know more about this website, read our review on RummyCircle. If you have any feedback on this tournament and other promotions from RummyCircle, post it in the comment section below.